When the French royal family was forced to flee France in 1829, they once again sough refuge in England. But this time, they weren’t welcomed with open arms. While Charles X had been very popular when living there during the French Revolution, the English too turned on him when they heard he had tried to repel the Constitutional Charter. The Duke of Wellington managed, not without difficulty, to offer the family a refuge in England, on condition that they arrive as private citizens. Thus Marie Therese assumed the name of Comtesse de Marne and Charles X was instead known as the Comte de Ponthieu. After a stay at Lulwirth Castle in Dorset, the family was sent to Edinburgh where they would be far away from the political scene. Charles settled down at Holyrood while Marie Therese, who disliked the palace, rented a house nearby for herself, her husband and her niece Princess Louise. Here, Marie Therese, who hoped her nephew Henry would rule France one day, set out to prepare him for the task. She supervised his education, as well as that of his sister, taught them to follow the customs of France abroad too and to help those in need. In 1832, the family moved again. This time they asked for help to the Austrian Emperor Franz, Marie Therese’s cousin, who offered them hospitality at the Hradschin Palace in Prague. Here, too, they lead quite a simple life. Marie Therese would attend Mass, write letters, invite friends over for dinner, continue her charity work and take care of her niece and nephew, whose mother, the Duchess de Berry had, in the meantime, remarried and settled in Italy. To little Henri and Louise their aunt was like a mother. In March 1835, the Emperor Franz died and his successor, Ferdinand I, decided to move into the Hradschin Palace. It was time again for Marie Therese and her family to find another place to live in. After some peregrinations, the following year, in October, they settled in Gorinzia. But soon after their arrival, Charles fell ill. He had caught cholera, which, at the time, was ravaging the Austrian territories. Marie Therese duly nursed him till his death, on 6 November. In 1844, she lost her husband too. Now a widow, she decided to move to Schloss Frohsdorf, a baroque castle near Vienna. 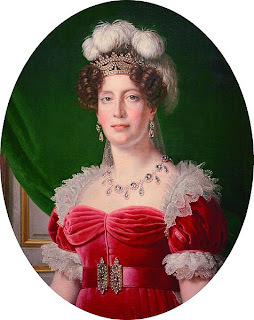 It was here that, on 10 November 1845, her niece Louise married Ferdinando Carlo, Hereditary Prince of Lucca. The couple, who settled in a house nearby, would go on to have four children. The following year, her nephew Henri married too. 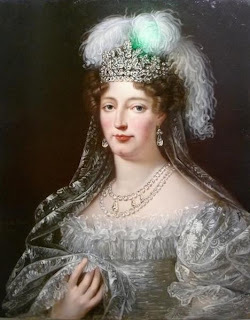 The bride was his second cousin Archduchess Maria Theresa of Austria-Este. When they weren’t travelling, the couple would stay at Schloss Frohsdorf castle. In 1848, a series of revolutions swept across the continent. Louis Philippe of France lost his throne and died in exile two years later. Marie Therese believed that his downfall was a punishment from God for having betrayed his family. She was now an old woman too but she still kept active. She kept having contacts with those who wanted to see the legitimate kings of France back on their throne, she kept up her charity work and continued to promenade daily. On one of these walks, she caught a chill, which turned into pneumonia. She died on 19 October 1851 and was buried next to her husband in the crypt of the Franciscan Monastery church of Castagnavizza in Görz.